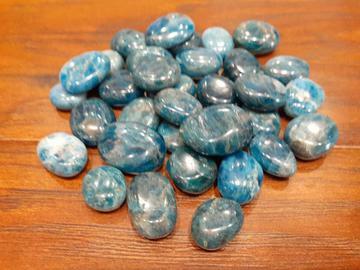 Apatite is a group of phosphate minerals, usually referring to hydroxylapatite, fluorapatite and chlorapatite in the crystal. Green and blue varieties, in finely divided form, are pigments with excellent covering power. A stone of the Throat Chakra, Blue Apatite helps with public speaking and enhances group communication. It also improves concentration and memory skills, and is a good crystal for study purposes.